We began our homeschooling journey after our oldest son finished fourth grade. At the time we had no idea what we were getting ourselves into, but we did know it wasn’t going to be another car line or parent/teacher conference. Completely new to the idea, our first year homeschooling consisted of one confused and frustrated fifth grader and one extremely neglected toddler. Thank God for Play-Doh. Shockingly, we all survived that first year, and what’s even more shocking, nine years later the boys are still alive and dare I say, happy with this crazy thing we do. It’s hard to believe, but we now have one son finishing up his first two years of college on his way to a university in the fall and another son halfway through his 7th-grade year and beginning to find his way in the world. After almost ten years on this journey, I can honestly say I’m glad we’ve stuck it out and I’m really excited about this last phase of the game. However, I wasn’t always so certain of the path. We’ve had our share of homeschooling through hard times and it hasn’t always been easy to stay the course. There’s one major catch in homeschooling: it happens at home. This seems like an obvious obstacle for a homeschooling family, yet for me, it’s been one of the hardest parts of the job to navigate. It’s hard to admit, but like all families, we’ve had our struggles at home. A family takes work. Sometimes it takes blood, sweat, and tears. Home isn’t always pretty when life gets ugly and if you’re a homeschooling parent it can be very discouraging to feel like you’re failing at your job because life’s circumstances have gotten in the way. Our family has had to homeschool through hard times on more than one occasion, and each time I questioned our homeschooling mission. Both of our boys have had tremendous obstacles to overcome that have required us to dig down deep in parenting and marriage. Raising children with special needs and mental illness is exhausting. Whoever “they” are? They’re not lying when they say there’s no instruction book for parenting! We’ve had our share of arguments, parenting fails, and painful recoveries. Add therapists, doctors, and endless appointments to the list and some days feel like you can never climb out of the parenting pit. Whatever your family’s struggles may be, homeschooling certainly doesn’t make it easier. My kids never suffered from taking time off. Embrace the freedom and flexibility of homeschooling through hard times. I’m so guilty of putting more pressure on myself and my kids when I’m stressed, but it’s always better to take a break. Nobody ever suffered from taking a week off or even just a day to regroup. My kid’s mental health will always take precedence over his math lesson! A friend who gets it makes a world of difference. Do you have a homeschool support group or a friend on this side of crazy? We need support from fellow homeschoolers! Find a friend you can count on for a good venting session or a shoulder to cry on. I tend to isolate myself when times are tough, but we are stronger together! Reach out to others in similar situations. Don’t be afraid to share your story. You’d be surprised to learn that others are going through the exact same thing! I’m so thankful for the special people God has placed in my life at the perfect time. The bare minimum is enough. When our family was really struggling, there were SO many days when all we could get to was a math lesson or a chapter in a book. Other days we watched educational movies on Netflix. Great! Something is always better than nothing! I’m glad I didn’t quit. It’s not always about homeschooling! Whatever your family is going through won’t magically go away if you send your kids to public school. When they come home after a long day, guess what will be waiting for them? The same problems they left there this morning before they hopped on the school bus. We all struggle, no matter what educational choices we’ve made for our families. Don’t be fooled into thinking it’s always about homeschooling. Whatever it is your family is going through? It’s only for a season. Hang in there. I promise you, This too shall pass. I know it feels like you can’t see the light at the end of the tunnel right now, but it’s coming. When this is all over you and your family will be able to look back and celebrate the victory of homeschooling through hard times! 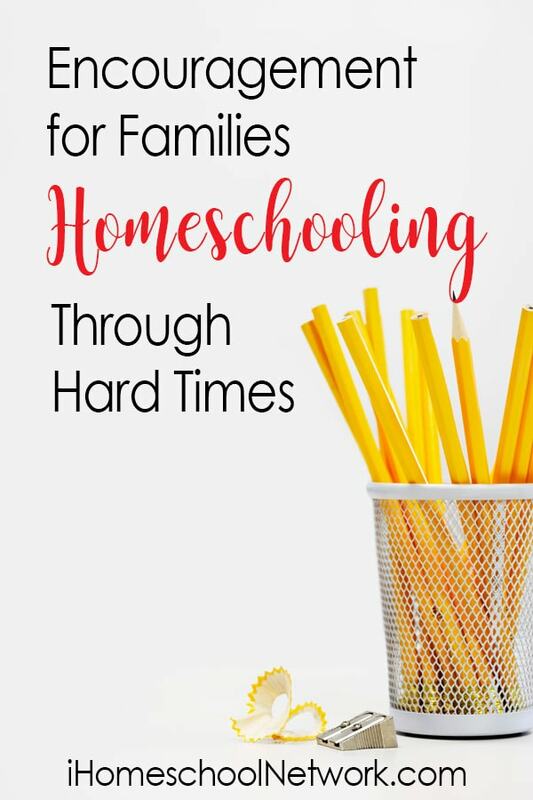 Are you homeschooling through hard times? You are not alone!